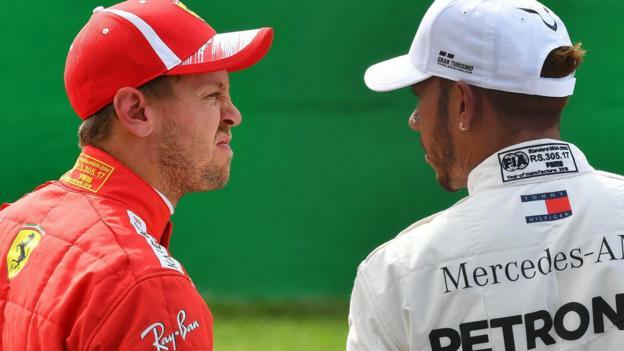 Sebastian Vettel still believes in his title chances despite falling 50 points behind rival Lewis Hamilton. The German’s deficit following Hamilton’s victory in Russia means even winning all the remaining races may not be enough for Vettel to be champion. “I’m clever enough to know it’s not getting easier if we lose points,” said the 31-year-old Ferrari driver. There are five races left, starting with Japan on 7 October. Grands prix in the United States, Mexico, Brazil and Abu Dhabi follow, with a maximum of 125 points available. Vettel, who finished third behind Briton Hamilton and his Mercedes team-mate Valtteri Bottas in Sochi, added: “We need to stay on top of our game which maybe we haven’t been completely this weekend. “[We must] make sure that from where we are now we focus on winning the last races. “It is not entirely in our hands. We need a bit of something to happen, but we need to make sure we are always there. “So if it is a third we can get, or a win, we need to get it – to make sure we do everything. England v Spain: Should Gareth Southgate go for points or experiment?